This is the picture of an Azure Kingfisher that I saw while I was guiding a Dutch visitor in Klasow valley of Sorong regency, Indonesia. At first, I thought it was a Dwarf Kingfisher but after reading some description in the field guide book Birds of New Guinea, I concluded that it was an Azure Kingfisher (Ceyx azureus). The bird lives near the river whose water is calm. I and the Dutch birder were sitting at the bank of a small river when I saw the bird landed on a vine just a few meters away from me. It was was a nice moment. I took my Fujifilm camera and slowly aimed it at the bird. I made several shots of the bird. There are several species of Kingfishers in the valley. Some of them include: Yellow-billed Kingfisher, Rufous-bellied Kookaburra, and Red-breasted Paradise Kingfisher. If you plan to go birdwatching in rainforest of West Papua, don't forget to bring a good pair of binoculars such as 10x42 that is made by Leica, Swarovski, Zeiss, or Nikon. There are a lot of species of Kingfishers in tropical rainforest of West Papua. I personally have seen a lot of them both in lowland, lower montane forest and in the islands of Raja Ampat, Klasow valley and Arfak mountains. In lower montane forest of Arfak range, while I was waiting for the Lesser Birds of Paradise to show up in the branches of trees above myself, suddenly I saw a Common Paradise Kingfisher (Tanysiptera galatea) landed on a branch of a tree just a few meters away from me. He sat there for less than one minute and then flew away again. Fortunately, I was able to make some pictures of the bird. It was the second time I saw the bird in relatively the same place. 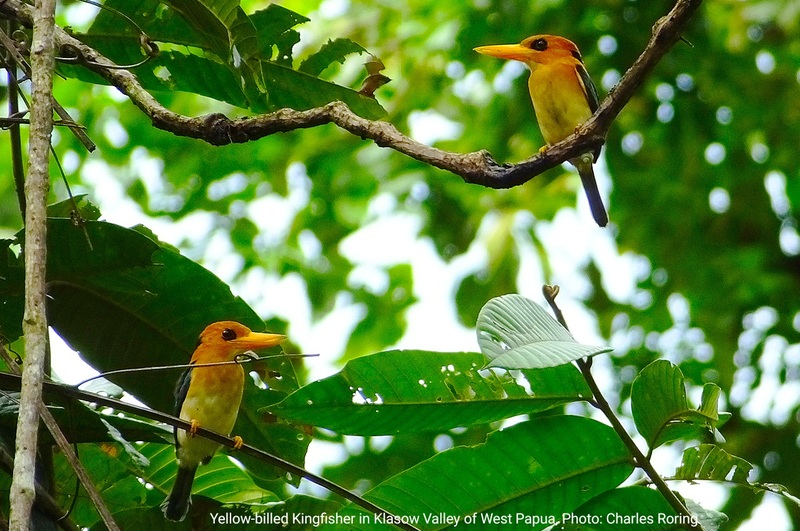 I also saw several species of Kingfishers in lowland forest of Sorong regency. Some of them include Red-breasted Paradise Kingfisher, Azure Kingfisher, Forest Kingfisher, Rufous-bellied Kookaburra and Yellow-billed Kingfisher. Some like to live along the sides of the river whereas others like forest edges near the village. 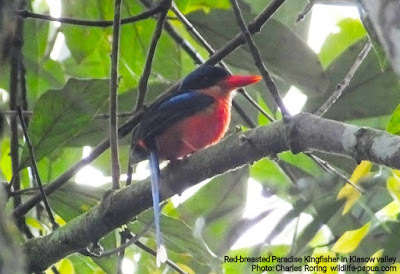 For the Red-breasted Paradise Kingfisher, I saw the bird several times in Klasow valley. I does not live near a river. The bird liked to sit alone one the branch of a tree with the above green leaves as heat cover. Actually, I did not see the bird. I was walking towards a tree where Lesser Birds of Paradise were dancing. A local guide stopped me and pointed his finger to the kingfisher. The bird was not far. I immediately aimed my Fujifilm HS 50EXR camera at the bird ant shot him. A few seconds later, the bird flew away. I was lucky, it was a good shot. For the picture of these Yellow-billed Kingfisher (Syma torotoro), I took it when I guided a Chinese lady in Klasow valley. We were trying to see King Bird of Paradise but he did not show up. Next, we moved on to the tree where Twelve-wired Bird of Paradise like to perch and dance. He did not come either. But ee heard the sounds of Yellow-billed Kingfisher at the forest edge that bordered with the clearing area of the village. We approached the birds. They were not afraid of us. Perhaps, the birds were so much attracted to each other. It was a mating season for the kingfishers, I think. In Raja Ampat, I had the chance to see Hooked-billed Kingfisher while walking in the forest in southern region of Waigeo. I also saw Beach Kingfisher on several occasions. Recently, I visited Waisai town of Raja Ampat for two days. While I was doing a short birding walk at a cape near the harbor of the town, I saw a Beach Kingfisher calling from a branch of a tree near the sea. He was quite big compared to other kingfishers. I will go to Sorong regency tomorrow again. I hope that I will be able to see and make photographs of the ones that I have not seen before.